J Swygart | The Lima News Lima Municipal Court Judge Glenn Derryberry issued oaths to 16 new court-appointed children's advocates Tuesday during a ceremony at the CASA offices in downtown Lima. The new advocates recently completed 35 hours of required training and will assist children who for no reason of their own are entangled in the legal system locally. 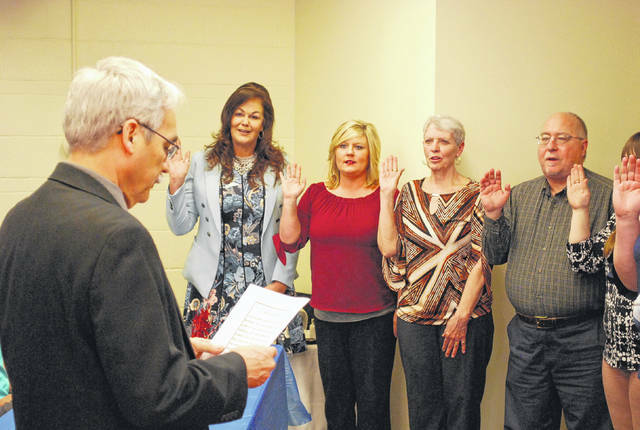 LIMA — Sixteen new child advocate volunteers were issued the oath of office Tuesday morning in ceremonies at the Court Appointed Special Advocates of Allen and Putnam Counties office in downtown Lima. According to Tim Thurston, director of CASA of Allen and Putnam Counties, the individuals issued their oaths have completed the required 35 hours of training and are now officers of the court. The CASA program trains community volunteers to act as guardians for children who are in the juvenile court system due to dependency, neglect or abuse. The new class brings to 86 the number of court-appointed child representatives currently on staff, but Thurston said that another 40 or more such volunteers are needed “to be the voice in court” of children in need. There were 365 cases involving children’s services in Allen County in 2016, although that number dropped off to 250 last year. The advocate program, which started in 2009, is operated under the umbrella of the Crime Victim Services agency and is funded by a variety of sources, from county stipends to state grants to private donations. Sworn in Tuesday as court-appointed special CASA advocates were Linda Crouch, Ricky Geesy, Ashley Gray, Shelia Haney, Cherie Hefner, Amy Helser, Andrea Hull, Lori McLean, Elizabeth Mayer, Genevieve Meyer, Elizabeth Sassi, Joyce Shaw, Heather Vermillion, Lora Violet, LaVonne Ward and Timothy White. Putnam County Common Pleas Court Judge Keith Schierloh congratulated the new advocates on their decision to serve the community. To learn more about becoming a volunteer or giving to the program, contact the CASA office at 567-940-2272 or email casa@crimevictimservices.org. https://www.limaohio.com/wp-content/uploads/sites/54/2018/05/web1_CASA-swearing-in.jpgJ Swygart | The Lima News Lima Municipal Court Judge Glenn Derryberry issued oaths to 16 new court-appointed children's advocates Tuesday during a ceremony at the CASA offices in downtown Lima. The new advocates recently completed 35 hours of required training and will assist children who for no reason of their own are entangled in the legal system locally.